In the past we hosted a Botox event once ever year, however, since the event was so popular we decided to make it a semi-annual event. 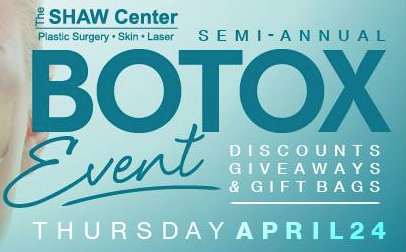 Our Semi-Annual Botox event is finally just around the corner! The event will be held this Thursday, April 24th from 9 AM – 5 PM. Spin our wheel to receive numerous prizes and discounts. Discounts include 10% off skincare products and markdowns on Botox. Various free gift bags will be handed out as well. Six lucky winners will receive Latisse for FREE. Don’t forget to enter our Latisse drawing for a chance to win. Although appointments were required in the past, no appointments are necessary. If you have yet to visit us at the SHAW Center, we are located at 8913 East Bell Road Ste. 201, Scottsdale, Arizona 85260. For questions concerning the event or if you would like to schedule an appointment, contact the SHAW Center at (480) 767-1900. We look forward to seeing you there!